Hellespont - The General Screw Steam Shipping Co. Ltd.
Machinery: 300 i.h.p. by Maudslay. Decks: One deck and raised with three masts. Type: Auxiliary Screw Steam Ship. Registered: No.277 on 28th August 1849 in London. Other info: Certificate granted 14th August 1849. The blades of the screw are capable of being fixed fore and aft, when not in use. History: 3rd October 1849. Arrived at Liverpool from London. 14th October 1849. Sailed from Liverpool for Malta and Constantinople. 23rd October 1849. Arrived at Gibraltar from Liverpool, for Malta and	Constantinople, 8 days out from Liverpool. 24th October 1849. Sailed from Gibraltar for Malta and Constantinople. 5th December 1849. Arrived at London from Constantinople. 14th December 1849. Arrived at Deal from the River and sailed for the Westward. 19th December 1849. Arrived at Liverpool from London. 26th December 1849. Sailed from Liverpool, Captain Watts, for Constantinople. 30th December 1849. Arrived at Gibraltar, from Liverpool, for Constantinople. 13th February 1850. Arrived at Gravesend from Constantinople and Smyrna, with 76 bls, 53 cs silk, 13 t bones, 1043 bls yellow berries, 7 dms scammony, 7 cks gums, 42 bgs sees, 2 bxs opium, 238 bgs Brazil coffee, 34 cks olive oil, 41 brls dates, etc. 15th February 1850. While heading for London meet the ‘Propontis’ in the river bound for Liverpool, the crews of both ships gave three hearty cheers as the vessels passed each other. 4th April 1850. Sailed from the Cape of Good Hope. 20th April 1850. Sailed from Sierra Leone. 25th April 1850. Sailed from Cape de Verde. 10th May 1850. Arrived at Plymouth, Captain Watts, with 80 bls goat’s wool, 8 bls goats skins, 19 cs silk, 35 bls wool, 40 bgs galls, 300 qrs wheat, 20 cs sponge, 9 brls raisins, 3 cs opium, 60 bgs valonia, 15 bls carpets, etc. 22nd June 1850. Sailed from Constantinople. 25th June 1850. Sailed from Smyrna. 30th June 1850. Sailed from Malta. 7th July 1850. Sailed from Gibraltar. 14th July 1850. Captain William Watts put into Plymouth and lands the mail. She has a full cargo of valuable goods for London and Liverpool. After coaling at Millbay Pier she proceeded up Channel with 51cs, 2 ps brass, 700 qrs Indian corn, 15 bls, 11 cs silk, 25 bls wool, 8 cs gum, 38 tns, 1cs copper, 37 bgs yellow berries,2462 ps boxwood, 56 bgs quills, 223 bgs cumin seed, 26 pkgs elephant teeth, 13 turtle, 4 chts tea. 18th August 1850. Arrived at Gibraltar, for Constantinople, after 6 days from Liverpool. 1st October 1850. Arrived at Gravesend from Constantinople. 3rd October 1850. Arrived off the Custom House, London, in 16 days 6 hours, from Smyrna, including stoppages at Malta and Gibraltar. She was laden with 140 tons fresh figs, £11,200 specie, a general cargo, and eight passengers. 15th October 1850. Sailed from Liverpool. 1st November 1850. Arrived at Gibraltar from Liverpool, for Constantinople. 14th November 1850. Sailed from Smyrna. Average speed 7·93 knots. 10th December 1850. Arrived at Gravesend woth 143 bls wool, 100 cs tobacco, 470 bxs raisins, 525 dms figs. January 1851. Had her hull painted with Chanter, Sunley & Co’s patent composition paint for the prevention of barnacles and marine deposits. 15th February 1851. Sailed from Plymouth at 12 noon. Captain W. Watts. She has one mail for Cape Verde, five for Sierra Leone, and 17 for the Cape of Good Hope, and £10,000 in specie for the Coast of Africa. 26th February 1851. Arrived at 10·45 a.m. and sailed from St. Vincent. 6th March 1851. Arrived and sailed from Sierra Leone. 29th March 1851. Arrived at Cape Town. 4th April 1851. Sailed from Cape Town at noon with a cargo consisting of ivory, oil and skins, eight packages containing specimens of natural history, 30 packages of sundries, and gold dust valued at £1,000. 20th April 1851. Sailed from Sierra Leone. 25th April 1851. Sailed from the Cape de Verde. 9th May 1851. Arrived at Plymouth at 6 a.m.
15th June 1851. Sailed from Plymouth at 2p.m. for Cape Town. Captain W. Watts. 27th June 1851. Arrived at St. Vincent. 2nd July 1851. Arrived at Sierra Leone. 24th July 1851. Arrived at Cape Town at 6 a.m.
1st August 1851. Sailed from the Cape of Good Hope. She was detained somewhat longer than allowed by her contract, she for several days not being able to take in fuel, and lying for the greater part of the time with steam up to ease her anchors. 16th August 1851. The ‘Hellespont’ arrived at Sierra Leone and repaired the old brasses of the ‘Sir Robert Peel’. Mr. Finlay, the engineer of the ‘Hellespont’, had his left foot crushed while walking on the engine platform of the ‘Sir Robert Peel’, to observe her progress after repair; his leg was amputated under the joint superintendence of the surgeons of the ‘Electra’, ‘Hellespont’ and ‘Sir Robert Peel’. She did not require coal but it is said was detained there 43 hours for the Governor to write despatches. 24th August 1851. Sailed from St. Vincent. Had to coal at the same time as another and lost 18 hours through the limited staff at the island. 10th September 1851. Arrived at Plymouth, midday, her cargo consists of wool, golddust, hides, skins, aloes, wines, and gold specie to the value of £2,000. 15th November 1851. Sailed from Plymouth at 3•30 p.m. for the Cape of Good Hope. 25th November 1851. Arrived at St. Vincent at 2 p.m.
26th November 1851. Sailed from St. Vincent at 2 p.m.
30th November 1851. Arrived at Sierra Leone at 7 p.m.
1st December 1851. Sailed from Sierra Leone at 10 a.m.
21st December 1851. Arrived at Cape Town, this being the quickest passage on record. 28th December 1851. Sailed from the Cape of Good Hope at 7a.m. for Plymouth. Captain William Watts. 11th January 1852. Arrived at 9 a.m. and sailed at 10 p.m. from Sierra Leone. 17th January 1852. Arrived at St. Vincent at 9 a.m.
18th January 1852. Sailed from St. Vincent at 8 p.m. It took 36 hours coaling. 30th January 1852. Arrived at Plymouth at 1 p.m. from the Cape of Good Hope with a full cargo of wool, and oil, thirty bales of general merchandise, and £1,000 worth of gold dust. 10th March 1852. Went into Plymouth docks and was thoroughly overhauled, and has been completely fitted out with a complete suit of sails made by Mr. Gordon, sailmaker. 11th March 1852. Went into Plymouth Sound. 15th March 1852. Sailed from Plymouth for the Cape of Good Hope. Captain W. Watts. She had a full cargo of British manufactured goods, £50,000 in specie for the payment of the troops, jewellery, plate for Gen. Cathcart, the newly-appointed Governor. 29th March 1852. Arrived at St. Vincent. 3rd April 1852. Arrived at Sierra Leone. 23rd April 1852. Arrived at Cape Town. 2nd May 1852. Sailed from Cape Town with a full cargo of wool, ivory, etc., and about £800 in gold dust. 18th May 1852. Sailed from Sierra Leone. 24th May 1852. Sailed from St. Vincent. 6th June 1852. Arrived at Plymouth, Captain Watts, from the Cape of Good Hope. The mail was left in the possession of Mr. Markes, the postmaster at Plymouth. 26th June 1852. Sailed from Plymouth for the Cape of Good Hope. Captain W. Watts. 8th July 1852. Sailed from St. Vincent. 29th July 1852. Arrived at the Cape of Good Hope, being a passage of 33 days, the shortest on record. 3rd August 1852. Sailed from the Cape of Good Hope. 11th August 1852. Sailed from St. Helena. 15th August 1852. Sailed from Ascension. 23rd August 1852. Arrived at St. Vincent where she was detained two days for coals. 25th August 1852. Sailed from St. Vincent. 8th September 1852. Arrived at Plymouth at 5 a.m. Richard Cross, the bankrupt of Southampton, who absconded from his creditors, taking with him a large quantity of jewellery and watches, and who left Plymouth on the 20th of July in the ‘Queen of the South’, was secured at Cape Town, in consequence of intelligence taken by the ‘Hellespont’ – which arrived only five hours before Cross, alias Talbot – has come home in the ‘Hellespont’ in charge of Mr. John Sedger, belonging to a division of the detective force. 18th November 1852. Sailed from Sierra Leone with cargo £4,000 in gold dust and specie, 15 tons cam wood, 50 casks of palm oil, 129 cases and 4 bags of pepper, 15 Boxes arrowroot, 6 casks bee’s-wax, and 6 packages sundries. 22nd November 1852. Sailed from Bathurst, (Gambia) with 112 bales 227 cakes bee’s-wax, 3 packages sundries, and £250 specie. 23rd November 1852. Sailed from Gorce. From Tenerife 83 casks wine, 472 bags cochineal, 24 baskets fruit, and 6 packages of sundries. 2nd December 1852. Sailed from Madeira. Cargo of 22 boxes of oranges. 8th December 1852. Arrived at Plymouth, chartered by the Royal African Mail Company with eight Passengers. 1853. Employed in running from the Cape of Good Hope and Natal. 26th February 1853. Sailed for Australia with instructions to that she should be sold on arrival at Sydney. 13th April 1853. Arrived at the Cape of Good Hope, Captain Watts. 17th April 1853. Sailed from the Cape for Australia. 21st May 1853. Sailed at 8 a.m. from Port Phillip. 27th May 1853. At Moore’s Wharf discharging cargo. 2nd June 1853. Arrived in Sydney in the afternoon from Melbourne. When off the Howe it was discovered that the quantity of coal on board was considerably less than supposed. Captain Watts was, therefore compelled to make sail on the vessel, and when it is considered that she made seventy-eight miles northing per day, with a strong head wind, her qualities as a sailing craft will be fully appreciated. 3rd June 1853. At Moore’s Wharf, Sydney. 11th June 1853. Took invited guests on a trip down the harbour. 12th June 1853. In the Cove, Sydney. 17th June 1853. In Darling Harbour, Sydney. 19th June 1853. A select party of gentlemen connected with the shipping interests of the colony dined on board and toasts were given to the success in placing so fine a vessel on the Sydney and Melbourne line. 23rd June 1853. Sailed for Melbourne with 19 passengers and 53 in steerage. Captain Watts. 3rd July 1853. Arrived at Sydney with 90 passengers. This being her first round trip. The passengers presented the Captain an address containing a gratifying expression of thanks for his attention and interest in their comfort, in the short but pleasant passage. 8th July 1853. On Patent Slip Wharf in Sydney. 9th July 1853. Sailed for Melbourne with 13 passengers and 26 in steerage. 18th July 1853. Arrived at Sydney. 23rd July 1853. Sailed for Melbourne from Patent Slip Wharf punctually at 3 p.m. having on board 28 cabin and 110 steerage passengers; amongst the former were three of the gentlemen who came from Melbourne to represent the corporation of that city at the late fancy ball. The Directors of the Company proceeded in the boat as far as the Heads, and, previous to going to sea, proposed the health of the Municipal Body of Melbourne, which was responded to by Mr. Aldermen Stephen. The Mayor of Sydney, accompanied by the Town Clack, Mr. Rae, went down in a steamer to see the deputation off, by which the Director’s returned. 30th July 1853. Sailed from Melbourne at 9 a.m. for Sydney. Had head winds all the way. While she was in Melbourne one of the stokers was unfortunately drowned by the capsizing of a boat. 2nd August 1853. Arrived at Sydney with 79 passengers. 6th August 1853. Sailed for Melbourne with 75 passengers. 10th August 1853. Captain Watts will have to appear at Geelong due to the non-delivery of the mail. As he stopped for the mail boat, as usual, and the latter came alongside, but owing to the water being found too low in the boiler, the engineer used the auxiliary boiler, which jetted a slight spray over the party in the boat, and that induced them to let go. Captain Watts, not knowing that he was bound to await their pleasure, especially as he had a large number of impatient passengers for Melbourne, held on his way; and the result was a summons from the Geelong Bench. A portion of the information will probably be that the spray from the boiler was intended “to do some grievous bodily harm” to the crew of the mail boat. 11th August 1853. Sailed from Melbourne with 70,000 ounces of gold. 16th August 1853. Arrived at Sydney with 262 passengers. 19th August 1853. Sailed for Melbourne with 86 passengers. 30th August 1853. Arrived at Sydney with 40 passengers. 3rd September 1853. Sailed for Melbourne with 92 passengers. 12th September 1853. 12th September 1853. A comet was noticed in the sky, while at sea by Captain Watts, before arriving at Sydney. 17th September 1853. Sailed for Melbourne. 19th September 1853. Rounding the Howe in heavy squalls and rain. 21st September 1853. Off the Promontory in a heavy gale and the barometer falling, she bear up for Rabbit Island. 22nd September 1853. Got under weigh and try to round the promontory, but to terrific seas and heavy squalls she put back and anchored in Sealer’s Cove. 26th September 1853. Left Sealer’s Cove for Melbourne. 27th September 1853. Arrived at Melbourne. She slightly touched the ground entering Port Phillip heads, but received no damage. Upon the vessel anchoring, a purse of forty sovereigns was presented to Captain Watts by Mr. Rollaston on behalf of the cabin passengers, as a small token of the high esteem in which he was held by them both as a gentleman and a seaman. The ship discharged 150 tons of cargo, and taken on board 40 tons of coals in 24 hours. Captain Watts was to attend Geelong Police Courts today. 29th September 1853. Sailed from Melbourne. 2nd October 1853. Arrived at Sydney. 4th October 1853. Sailed from Sydney. 10th October 1853. Arrived at Melbourne. Due to heavy gales she was detained three days, during which time she carried away her jibboom in steaming against a heavy head wind. 12th October 1853. Sailed from Melbourne. 15th October 1853. Arrived at Sydney with 104 passengers. 18th October 1853. Sailed from Sydney with 76 passengers. 26th October 1853. Sailed from Melbourne for Sydney, Captain Watts. 30th October 1853. Arrived at Sydney with 1305 ozs of gold and 93 passengers. 2nd November 1853. Sailed from Sydney for Melbourne. From Melbourne she will go to Launceston to have her bottom cleaned. 9th November 1853. Arrived at Launceston from Melbourne, it is supposed for repairs. 12th November 1853. Lying at George Town to be cleaned and re-painted. 20th November 1853. Sailed from Launceston for Melbourne, in ballast. No passengers. 23rd November 1853. Sailed from Melbourne. 26th November 1853. Arrived at Sydney from Melbourne with 78 passengers. 30th November 1853. Sailed from Sydney. 10th December 1853. Arrived at Sydney, Captain Kendall, with 207 passengers. 14th December 1853. Sailed for Melbourne with 70 passengers. 21st December 1853. Sailed from Melbourne for Sydney, Captain Pockley. 23rd December 1853. Sailed from Melbourne. 24th December 1853. Arrived at Sydney, Captain R. F. Pockley, with 185 passengers. 27th December 1853. Sailed for Melbourne with 102 passengers. 29th December 1853. Sailed from Melbourne with 65 passengers. 8th January 1854. Arrived at Sydney with 144 passengers. 11th January 1854. Sailed for Melbourne with 137 passengers. 17th January 1854. Sailed from Melbourne. 21st January 1854. Arrived at Sydney with 78 passengers. 27th January 1854. Sailed from Sydney. 6th February 1854. Arrived at Sydney. 8th February 1854. Sailed from Melbourne. 15th February 1854. Sailed from Port Phillip with the English mail off the ‘Golden Age’. 18th February 1854. Arrived at Sydney. 22nd February 1854. Sailed for Melbourne. 2nd March 1854. Sailed from Melbourne for Sydney. 5th March 1854. Arrived off the Heads, but in consequence of it being very thick, Captain Pockley thought it prudent not to venture in till the morning. 6th March 1854. Arrived at Sydney with Passengers – Mr. and two Misses Leopold, Mr. and Mrs. Somerville, Mr. and Mrs. Bauer, Mr. and Mrs. Galkas, Mrs. Daly, Captain M’Lean, Messrs. Campbell, Andrews, Galinay, Robinson, Rovidon, Slee, Shannon, Malcolm, Wadring, Jones, Worley, Muir, Scott, Sing, Tidmas, Christie, Appert, Morrisey, King, Walsh, Freakman, Smith, Dunn, Master Williams (2), and 126 in the steerage. 20th March 1854. Arrived at Sydney with 65 passengers. 25th March 1854. Sailed for Melbourne with 67 passengers, with a cargo of 35 kegs butter. H. Clark; 6 packages hardware, Lavicks and Piper; 2 cases biscuit, I. Abrahams; 2 cases drapery, Ray, Glaister, and Co; 1 cask nails, T. Bowden; 8 packages stationery, Sands and Kenny; 580 packages sheet iron, T. Woolley. 6th April 1854. Arrived at Sydney with 60 passengers. 20th April 1854. Sailed for Melbourne with 59 passengers. 1st May 1854. Arrived at Sydney with 92 passengers. 4th May 1854. Sailed for Melbourne. 14th May 1854. Arrived at Sydney with 27 passengers. 18th May 1854. Sailed for Melbourne with 78 passengers. 28th May 1854. Arrived at Sydney with 79 passengers. 1st June 1854. Sailed for Melbourne with 47 passengers. 11th June 1854. Arrived at Sydney with 118 passengers. 16th June 1854. Sailed for Melbourne with 116 passengers. 26th June 1854. Arrived at Sydney. 1st July 1854. Sailed for Melbourne with 64 passengers. 11th July 1854. Arrived at Sydney with 117 passengers. 14th July 1854. Sailed from Melbourne, with 54 passengers. 20th July 1854. Sailed from Sydney with 84 passengers. 22nd July 1854. Sailed from Melbourne at 6 p.m.
25th July 1854. Arrived at Sydney with 101 passengers. 8th August 1854. Sailed from Melbourne and encountered a succession of heavy gales, in which she was compelled to put into Twofold Bay, having split all her canvas. 11th August 1854. Arrived at Sydney, Captain Pockley, with 137 passengers. 23rd September 1854. Completed repairs and overhauling of the ship and engines. 25th September 1854. Sailed from Sydney, Captain David Pole, with 68 passengers. 16th October 1854. Sailed from Melbourne at 6 p.m. She touched at Twofold Bay to land passengers. 19th October 1854. Arrived at Sydney with 85 passengers. 24th October 1854. Sailed for Melbourne with 57 passengers. 1st November 1854. Sailed from Melbourne. 2nd November 1854. Arrived and sail from Portland. 6th November 1854. Arrived at Adelaide. 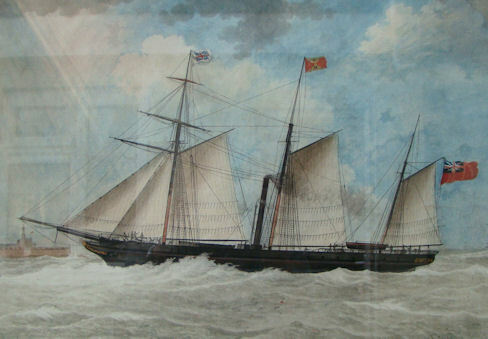 Through an accident which occurred to the steamship ‘Governor-General’, on the line from Melbourne to Sydney, it was the intention of that Company to employ the ‘Hellespont’ in her place; but the repairs being completed, they have determined that the ‘Hellespont’ should resume her position as a trader between Adelaide and Melbourne, at least for the next three months. 7th November 1854. Sailed from Adelaide. 9th November 1854. Called into Portland Bay to see the wreck of the ‘Nene Valley’. The engineer of the ‘Young Australian’ came on board and stated that they had been lying in Portland Bay for more than a week, but were then making preparations for another trip to the wreck of the ‘Nene Valley’. He also stated that there was between £500 and £800 worth of property lying on the beech from the wreck, but were unable to get it on board on account of the weather. 12th November 1854. Arrived at Sydney from Adelaide. 16th November 1854. Sailed from Melbourne for Portland Bay. 17th November 1854. Arrived at Portland Bay. 18th November 1854. Arrived at Adelaide from Melbourne. 21st November 1854. Sailed from Adelaide for Portland Bay. 23rd November 1854. Sailed from Melbourne for Sydney. 5th December 1854. Arrived at Sydney with 91 passengers. 11th December 1854. Sailed for Melbourne with 35 passengers. 19th December 1854. Arrived at Sydney with 103 passengers. 23rd December 1854. Sailed for Melbourne with 51 passengers. 30th December 1854. Sailed from Melbourne and passed a strange three-masted screw steamer entering in harbour, also the clipper ship ‘Lady Octavia’. Later passed the ‘Argo’. 2nd January 1855. Passed the ‘Argo’ about 10 miles north of the Dromedary. 3rd January 1855. Arrived at Sydney with 80 passengers. 6th January 1855. Sailed for Melbourne with 45 passengers. 17th January 1855. Arrived at Sydney with 44 passengers. 22nd January 1855. Sailed for Melbourne with 43 passengers. 30th January 1855. Sailed from Melbourne. 1st February 1855. Arrived at Sydney. 6th February 1855. Sailed for Melbourne. 17th February 1855. Arrived at Sydney. 24th February 1855. Sailed for Melbourne. 3rd March 1855. Sailed from Melbourne. 6th March 1855. Arrived at Sydney with 15 passengers. 13th March 1855. Sailed for Melbourne with 31 passengers. 16th March 1855. Arrived at Melbourne. 20th March 1855. Sailed from Melbourne. 25th March 1855. Arrived at Sydney with 55 passengers. 30th March 1855. Sailed for Melbourne with 47 passengers. 17th April 1855. Sailed from Sydney, Captain W. Watts. 27th April 1855. Arrived at Sydney with 51 passengers. 1st May 1855. Sailed for Melbourne with 98 passengers. 8th May 1855. Sailed from Port Phillip Heads at 5•45 p.m.
11th May 1855. Arrived at Sydney with 32 passengers. 15th May 1855. Sailed for Melbourne with 62 passengers. 20th May 1855. Fallen in with severe gales and has split many sails. 21st May 1855. Arrived at Melbourne with passengers – Mrs. Murphy, Mrs. M’William, Mrs. Bryant, Messrs. Phillipson, Grieve, Tingcomb, Lethbridge, Charles, Jephson, Lumsdale, Cleggett, and 51 in the steerage. Cargo= 1 case drapery, Ray, Glaister, and Co; 18 coils rope, 60 bundles shovels, Vickery Brothers; 12 cask 2 cases fruit, Davis; 1 case 1 keg 1 box printing materials, L. Sharwood and Co; 7 bags maize, 1 cask molasses, J. L. Tebbutt; 70 bags salt, 15 cases biscuits, 12 casks oatmeal, A. Fairfax and Co; 1 case, J. V. Barnard and Co; 3 casks, 6 kegs, 2 mills, 2 wheels, Levicks and Piper; 41 bags potatoes, 24 kegs butter, H. Clarke; 2 bales carpeting, 3 bales, 17 casks, C. Burton; 2 cases boots, W. Wilson, jun., and Co; 22 casks fruit, J. Neads; 30 bags onions, M’Kellar; 50 bags potatoes, 15 bags onions, S. Priestley; 1 cask sundries, Hawley and Co; 9 horses, Mr. Jenner; 3 horses, J. Gough. 22nd May 1855. Sailed for Sydney. 27th May 1855. Arrived at Sydney with 89 passengers, and a few horses. 29th May 1855. Sailed for Melbourne with 113 passengers. 1st June 1855. Arrived at Sydney. 8th June 1855. Arrived at Sydney with 23 passengers. 12th June 1855. Sailed for Melbourne with 75 passengers. 19th June 1855. Sailed from Melbourne. 22nd June 1855. Sailed for Melbourne. 23rd June 1855. Arrived at Sydney with 38 passengers. 16th July 1855. In Waterview Bay Dry Dock, where she is being scraped and painted. The screw is also being taken out, and the machinery for feathering it and being properly adjusted. Also new boilers. 29th July 1855. Steamed to Bradley’s Head with the Directors of the Sydney & Melbourne Steam Packet Co, then back to Watson’s Bay, thence to the Company’s Wharf. Captain Watts. 9th August 1855. Sailed for Melbourne. 14th August 1855. Sailed for Melbourne. 24th August 1855. Arrived at Sydney with 27 passengers. 28th August 1855. Sailed for Melbourne with 44 passengers. 31st August 1855. Arrived at Melbourne. 4th September 1855. Sailed from Melbourne. 7th September 1855. Arrived at Sydney with 44 passengers. 11th September 1855. Sailed for Melbourne, Captain Rimmer, with 41 passengers. 18th September 1855. Sailed from Melbourne. 20th September 1855. Arrived at Sydney in record time of 47½ hours, with a detention of 2 hours due to fog with 56 passengers. 27th September 1855. Sailed for Melbourne, Captain Watts, with 35 passengers. 30th September 1855. Arrived at Melbourne. 2nd October 1855. Sailed from Melbourne. 4th October 1855. Arrived at Sydney with 42 passengers. 9th October 1855. Sailed for Melbourne with 36 passengers. 13th October 1855. At Melbourne from Sydney with passengers, cabin Mrs. Frazer and child, Mr. and Mrs. Workman, Messrs. E. Aurback, M. Wiseberg; and 35 in the steerage. 16th October 1855. Sailed from Melbourne. 19th October 1855. Arrived at Sydney with 9 passengers. 22nd November 1856. Put up to public auction, but the biddings were not equal to the reserve. It was stated, that parties were likely to buy privately at a higher rate. 22nd January 1856. Sold by D. Lapraik, to Edye Manning & David Jones. 9th February 1856. Sailed from Sydney for Melbourne. Captain Keys. March 1856. Under charter, and later, sold to Jardine, Mathieson & Co.
16th February 1856. Sailed from Melbourne for Singapore. 10th October 1856. Arrived at Shanghai, Captain Crockett, from Hong Kong. 2nd November 1856. Arrived at Hong Kong, Captain Crockett, from Shanghai. 11th December 1856. Arrived at Shanghai, Captain Crockett, from Hong Kong. 31st December 1856. Arrived at Hong Kong, Captain Crockett, from Shanghai. 17th March 1857. Arrived at Hong Kong, Captain Crockett, from Shanghai. 22nd July 1857. Sailed from Shanghai, Captain Crockett. 28th October 1857. Arrived at Hong Kong, Captain Crockett, from Shanghai. 24th October 1858. Sailed from Woosung for Hong Kong, Captain Crockett. 31st March 1859. Sailed from Hong Kong, Captain Bolton, for Shanghai. 22nd December 1859. Sailed from Shanghai with 300,000 Mexican dollars. 28th June 1860. Arrived at Hong Kong from Shanghai and Foochow. September 1860. Engaged in the coast traffic between Swatow, Amoy, Foo-Chow, and Shanghai. 1860. Sold to Howard & Co, Shanghai. February 1862. The ship was leaking in Rangoon Roads, and not being able to secure a sufficient number of Burmese to assist the crew in pumping her, was obliged to employ thirty Burmese females to do so. 3rd April 1862. On the Yang-tze River by the city of Kiang-yin, the rebel forces were fighting nearby. The steamer ‘Hellespont’, with a brig alongside, lay abreast of an enclosure with firewood, which was safe; the Howard and Co’s flags were flying in the enclosure. 21st December 1863. In collision with the French steamer ‘Hydaspe’ and immediately sunk. The crew and passengers were saved by the ‘Hydaspe’, which put back leaky. The ‘Hellespont’ was from Hankow, Captain Mackenzie.